Check for special local ordinances governing garage or yard sales. Do you need a permit? Are there limits on the number of garage/yard sales you can have per year? Are there regulations regarding signs? Don’t forget to take signs down when the sale is over. Some communities fine people who do not remove their garage sale signs promptly. What about selling homemade foods? Check your homeowner’s insurance policy to check for coverage in the event of an accident. Choose an easy to get to location. Ideal locations are centrally located neighborhoods in town. Combine your efforts with a neighbor or two for more variety and greater impact or capitalize on community garage sales. Community or neighborhood garage/yard sales can increase the traffic and sales while cutting advertising costs. Don’t forget to check advertising regulations, yes, some communities have sign ordinances; believe me, I learned the hard way. Utilize a variety of advertising methods for best results. There’s a market for almost anything; linens, antiques, collectibles, clothes, household goods are all good selling items. Common sense says all items should be clean and in good working order. Clothes should be clean, free of spots, folded or hung on hangers. Organization is crucial – arrange merchandise according to various categories – books, children’s clothes, household goods, garden items, etc. Make it easy for customers to see and inspect the items for sale; potential buyers don’t want to dig through piles of unorganized clutter. Selling appliances? Attach the warranty and operators manual, if available for increased sales. Place small items or those most likely to be subject to theft (yes, theft can happen at garage and yard sales) near the cashier’s table or in a highly visible location. One of my biggest pet peeves is unmarked items. Proper pricing methods can make the difference between a sale and a disgruntled customer who stomps away. Visit a couple of garage or yard sales in your community to get an idea of the value of commonly sold items. Tape, slips of paper or stickers, can be used to individually price items to aid shoppers and reduce confusion. Grouping like items by price (jeans, t-shirts, purses/bags, etc.) is another acceptable pricing strategy. Organize your selling area so shoppers must exit by the cashier. Never leave the cash drawer unattended. Ideally, it’s best if you have at least two individuals to assist with the sale; one to serve as the cashier and the other to keep the sales area tidy and assist customers. Start with $15 to $20 in change (quarters, dimes, nickels) and about 20 one dollar bills in your cash drawer/money box. For safety purposes, don’t keep all of your money in your cash drawer; keep about half in the drawer and the other half in a safe location away from the sales area. As you plan the sale, don’t forget to plan for the disposal of unsold items. There are individuals who will buy unsold garage sale items, others who will haul unwanted items away for the taking, or you can donate to a local thrift store or charity. 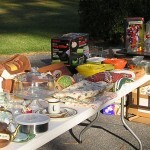 Successful yard and garage sales don’t just happen; they take careful planning and organizing. They can be time well spent on reducing unnecessary household clutter and unwanted items while benefitting the family financially. Planning A Garage Sale, United Van Lines, #1, United Drive, Fenton, MO. Berko, Rober L. Holding Successful Garage Sales for Fun and Profit., Consumer Education Research Center, 1990.